A block of rooms has been reserved for the Canadian Association of Bariatric Surgeons and Physicians (CABPS) 1st Annual Conference from June 7, 2012– June 9, 2012. The special room rate will be available until May 7, 2012 or until the group block is sold out – whichever comes first. 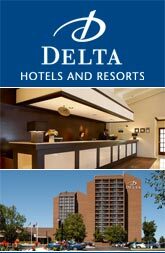 The Delta Meadowvale Hotel and Conference Centre is conveniently located close to Highway 401 and Pearson International Airport. It is a short cab ride to cultural downtown Toronto and just a few blocks away from various local attractions such as the Playdium, Sherway Gardens and Fantasy Fair. This hotel features 374 guest accommodations on its 15 floors. These recently renovated, air conditioned guestrooms are artfully decorated and features a pillow top mattress, premium cable channels, pay movies, electronic/magnetic keys, rollaway beds, and a private bathroom equipped with a hair dryer and a shower/tub combination. Amenities offered in this hotel include spa services, pool side bar, indoor and outdoor swimming pools, sauna, spa tub, tennis and squash courts and a health club. For more information click here.